Many people seem to think I am brave for doing the Great Loop, by myself on a Ranger Tug. There are days I feels brave, days I feel naive, and others when I feel pretty wimpy and humble. Today is one of those wimpy and humble days. I have had them before, like when I saw a cockroach running across the floor in my cabin on Annabelle. 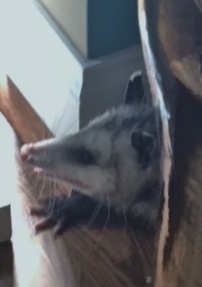 Today the culprit was a possum in my living room. My faithful dog, Lucy, brought my attention to the furry rodent by barking up at me, while I was working in my office. It was different than the normal bark of someone being at my front door, or a neighbor walking a dog. It was more like “Hey! You up there! Come check this out.” As a border collie, Lucy is a natural herder. As I went down the stairs, I noticed she wasn’t in her usual spot near the front door, but was laying on her belly looking at something behind the couch, closer to the window. She seemed to have it in a checkmate position. I looked from the other side of the couch, screamed, and ran back up the stairs. Frantically, I searched my cell phone wondering who I could call for help. Many names went through my head, and I settled on the closest possible person, my neighbor Gus, a retired police officer. I quickly found his name in my list of recent texts and hit the phone icon. He was an hour away in Wilmington and suggested I call the police for animal control to come out. I tried calling another neighbor, who didn’t answer. I texted a friend who just came out of surgery, who suggested these animals are so harmless that they could be pets. Painkillers can affect judgment. I called the police, who offered to send over an officer. I didn’t feel it was an “officer-worthy” emergency, but what choice did I have? A moment later, I heard my front door fly open, so I ran back down the stairs to find Gus’ wife, Beth, who had just stormed into my living room with a long 1X3 board. “I’m gonna get that possum!” She shook the board at the terrified animal, poked and pushed it towards the front door. The possum bared it’s sharp little teeth at her and hissed. The possum scurried out the front door, and the battle was won. I had no idea that Beth was such a force to be reckoned with. In the heat of battle, she even managed to take a picture! I called the police and cancelled the house call, grateful that I didn’t need them anymore. On days like today, I wonder how our perceptions are formed, and how differently we react to things. Many years ago, a young intruder came into my house in the middle of the night, and my dog led this young man to my bedroom. I woke up when he flipped on the light switch. He had been in a fight down the street and asked to use my phone, a land line, years before cell phones existed. My nurse instinct kicked in and I had him sit on the side of my bathtub. I got ice for his wounds and called 911. I even searched him for weapons, checking his socks and his pockets. Within a few minutes, the police arrived to assess the situation, then they called for an ambulance. At the time, I didn’t know the young man or the circumstances of the fight. Yet, I was not afraid and handled the situation much differently than someone else might have. Clearly, the possum was probably more scared than I was this afternoon, and any rational person could see it. The young man who came into my home in the middle of the night was probably a much more realistic threat. I am glad I didn’t approach him with a 1X3 or any other weapon. One way or another, we each respond to perceived threats differently and when things work out well, nobody (or animal) gets hurt. I guess that’s as much as anyone can ask for.